For the past 3 and a half terms I’ve been thinking far more deeply about home learning. Three reasons for this; firstly we have no set structure for home learning in maths at my school, except for it to be set on a periodic basis (differing for KS3 and 4) and it is assumed it will be comment marked. Then, I was receiving very poor quality home learning, if any, from some groups, which I needed to deal with. Finally, my son started in year 2 last September and was given weekly numeracy and literacy homework, which started many a conversation with fellow parents of year 2, conversations which are still going into year 3. I have read overviews of Hatties research, particularly from @guruheadteacher here. It makes sense to me regarding the impact of homework on different age groups, and reinforced my own personal opinion that homework in primary school isn’t necessary. Last year I experimented with different types of home learning. Not great for consistency for the pupils, but it did give me ideas of what worked well and I could take forward. My own philosophy in home learning is that it must be able to be done independently and I must be able to give a specific reason for setting that home learning. The difficulty with the assumption that the home learning would be comment marked was that those who didn’t hand it in didn’t get feedback, and so couldn’t make improvements in their understanding and work. Before I get to what I have ended up with this year, below is a summary of what I tried. This is made up of a question on each area of the topic we had covered since the last home learning. It would include a problem solving question and a literacy question where possible. I’d put in challenge questions, which weren’t compulsory, and include past exam questions for GCSE groups. A set of questions based around the basic skills scheme that we use on a fortnightly basis. Questions would be set from where I’d seen difficulties and were levelled, so each pupil would have the same level as they were working on in class. Types of question would be repeated for 3-4 home learnings to allow pupils to refer to and act on feedback for the next home learning. Pros: there was clear improvement from pupils week on week as they used feedback to inform them. 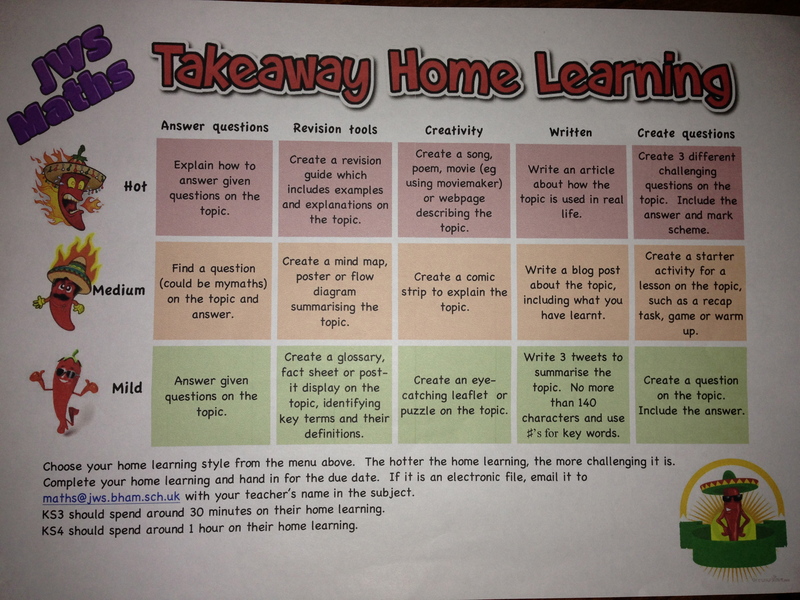 Inspired by Ross McGills book and directed to the the takeaway home learning by my supportive Assistant Head, who has responsibility for T&L, I put together my own takeaway home learning. I didn’t want to over complicate the set up as the aim was for pupils to produce a quality piece of home learning. Pros: more home learning was handed in, and different styles used to consolidate understanding of the skills the pupils had been learning; feedback from SEN department was that it was more accessible for their pupils. Cons: I had put a questions choice in their, and some pupils were quickly and badly answering that section, rather than create their own takeaway home learning. These were different to the topic exercises as the questions were based on what the pupils had just been learning in the last 1-2 lessons. There would be repeated questions, gradually getting more complex and the aim was to reinforce the pupils ability and memory for what they had just been learning. Pros: pupils were using skills that had very recently learned and so the practice was consolidating this. As it was repeated practice on a smaller range of skills, it enabled more effective and focused feedback to pupils. We are provided with past exam papers and practice papers for our Year 11 groups and some of these were to be set as home learning. Strategies such as odd questions only meant that it could be used within the 1 hour weekly home learning slot for KS4. Pros: pupils were able to get guidance for questions they had struggled on, and use this to improve their answers, and some pupils were independent enough to use maths watch to help revise how to answer certain types of questions. Cons: using exam papers for home learning meant that I didn’t then have them to use in lesson time, and sporadic completion of the exam papers meant that some pupils were (wilfully) missing out on a valuable resource. I would set this home learning if I was going to assess pupils on a particular topic the next lesson. Pupils home learning would be to prepare a cheat sheet on that topic – what information, facts, methods etc. would they write down to take in an exam with them, if they were allowed. Pros: it allowed pupils to write down information, and choose specifically what they thought would be useful. They were allowed to use this sheet in their assessment, so they had something to refer if they were getting a bit stuck. I also had a comment that they didn’t need to use their cheat sheet because they had remembered what they had put on it. Cons: it was a poorly completed home learning, which then meant several pupils weren’t prepared for the assessment. I only used this once, so shouldn’t really make any judgements on it, but I did ask one year 10 class to prepare some work on Pythagoras. They’d covered it before in year 9 and we were about to start Trigonometry, so I thought it would be a useful home learning so they’d refreshed their memories before the lesson. Pros: pupils came to the lesson prepared for the topic, so more lesson time could be used purposefully rather than revising. Cons: pupils who didn’t do the preparation would need more lesson time to get them up to speed. Following this, and in keeping with my philosophy for home learning, I’m setting two main types this year. Earlier on in the topic , I set a practice questions task in an aim to consolidate pupils learning. I have been including useful information on the worksheet to help focus pupils. The second type is a takeaway home learning piece, without the option of completing given questions. The aim of this is for pupils to revise the topic and consolidate their understanding in a style they prefer. I did like the cheat sheet, and it worked well for pupils who actually did it, so I will be setting that sometimes instead of the takeaway home learning. For marking, I am comment marking the practice questions with www. ebi .com, in line with our school policy. The takeaway home learning will receive a RAG123 mark (and often a short comment from me), but on these home learning due days, I set an assessed task in lesson, which I will be able to give the www. ebi .com feedback on. The basic skills I now just do as starters for years 10 and 11, very similar to @just_maths bread and butter questions and @corbettmaths 5 a day. I have set one part of an exam paper so far for Year 11, but saved three questions to complete in exam conditions at the start of the lesson it was due in. I’m also thinking of starting an exam paper in lesson, then setting home learning as completion of it, in a different colour pen. So far I have seen an improvement of the quality of home learning that is produced, and that implies to me that it is more effective for the pupils completing it. Or Takeaway Home Learning as we call it at our school. Have read a bit about this on the internet following being pointed in that direction by our assistant head (in charge of teaching and learning). So I’ve developed one for maths, and have started trying it out with a couple of groups. So far so good. Next step, to present to the teaching staff as a “one minute wonder” in briefing. I really like the idea, especially that it gives pupils choice on the style of their home learning, which in turn I hope will only benefit them. Next part to develop is some sort of way to encourage pupils to try different styles.